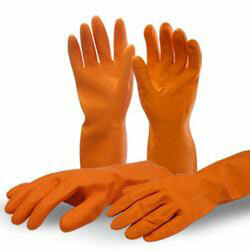 The company is engaged in the supplying of Safety Rubber Gloves all across the world. The Safety Rubber Gloves, that we provide, are especially designed out of the best rubber available in the market. Acquired from the well-known sources, our Safety Rubber Gloves are high in quality, hygienic, stretchable, and long lasting.